The summer holidays are finally upon us which means lazy mornings and time to make something a bit more special for breakfast! 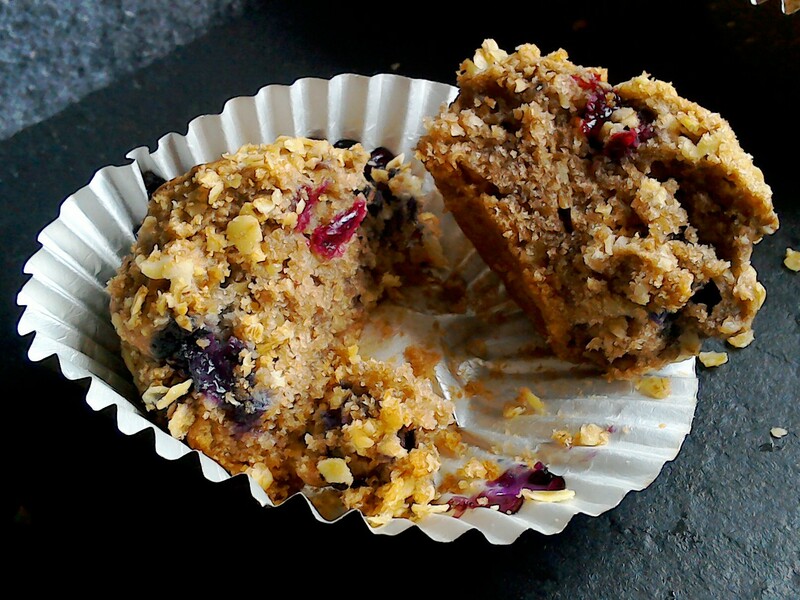 These Vegan Blueberry Muffins are Dairyfree, Soyafree, Eggfree and full of fruity, oaty goodness to keep the Peachicks filled up & fuel all the paddling pool splashing! Alongside the oats and frozen blueberries, these muffins contain less than 3g of added sugar each even with the crunchy oaty topping. (Obviously there is the natural sugar content of the berries and oats, if you are counting those too!) Instead of golden syrup I have used Sweet Freedom Choc Shot which has worked really well and isnt too sweet. The basic recipe can be altered to fit lots of different seasonal fruit… I have my eye on a plum and ginger batch when the ones of the tree out the front are ready! I should apologise for the quality of the photos. I was playing around with the WordPress app as I wanted to see what kind of quality I could get from our little Hudl as a viable alternative to upgrading my phone. Also I dropped the laptop and the screen is a teeny bit unhappy these day!! Needless to say I am not overly impressed with the WordPress app OR the photos, even after editing them… so back to my Lumix & Laptop it is then!! I like how quick these are to whip up although (sadly?) They don’t keep all that well unless frozen so are best eaten warm… with coffee… lots of coffee!! Especially if you have a particularly packed day of Peachick entertaining to do! So here is the recipe for my Vegan Blueberry Muffins. You can substitute the frozen blueberries for fresh but I always have frozen fruit in my freezer! 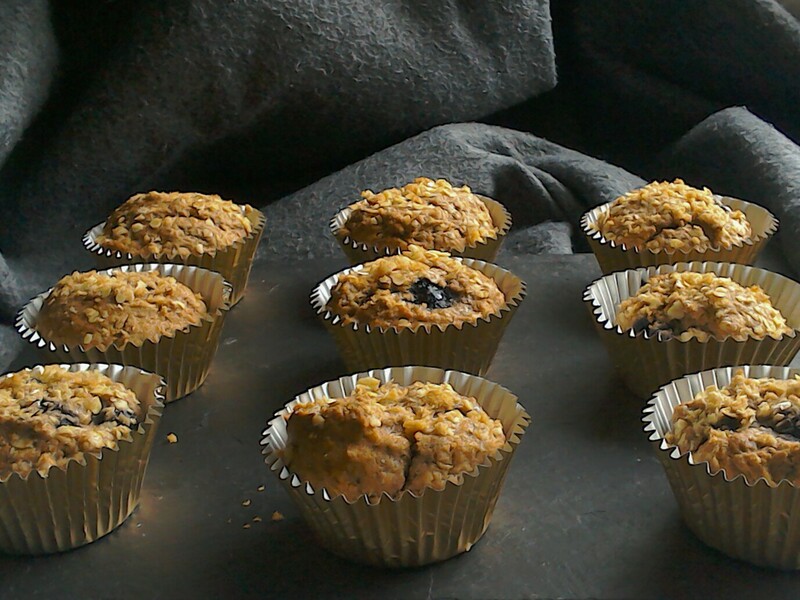 Easy Vegan Blueberry Muffins. A quick & simple to make but packed full of flavour and oaty, fruity goodness! Also low refined sugar with less than 3g in each muffin. Preheat the oven to 170C and line muffin tin with paper cases. Mix all the dry muffin ingredients together (Flour, Oats, Chia Seeds and sugar) in a large bowl. In a separate jug measure out the Koko, Oil and Choc Shot. Stir then pour into dry ingredients. Gently combine the ingredients before folding in the frozen blueberries. Using a cookie scoop fill the muffin cases. In a small bowl stir together the crumble topping ingredients and sprinkle over the muffins before baking for 18-25mins. Vegan recipes are not very common in people to discuss and post on blogs, you doing really good work. From recipe I can tell its delicious and when I am going to try this is going to amazing. Thanks for sharing with us. thank you! I was just having a proper grump about my phone as it makes everything look really grey! Thank you! Let us know if you do! The Peachicks demolished them! !